Saturday night in St Louis was a busy night for concerts. With choices like Kansas, Alice Cooper, and Fleetwood Mac, what’s a classic rock fan to do? This fan fortuitously found herself at the Kansas 40th Anniversary Point of Know Return performance at the Fox Theater, and believe me when I say, I was not disappointed. You know those concerts where a handful of people leave a few songs before the finale to beat the rush? This was not one of those shows. The current Kansas lineup includes only 2 of the original founding band members, Phil Ehart on drums, and Rich Williams on guitar. While waiting for the show to start, I overheard someone wondering aloud “How do you replace Steve Walsh?” and I thought- that’s a great question. Although I have seen Kansas play live before, this would be my first time having the pleasure of seeing lead singer Ronnie Platt, who replaced Walsh as lead singer when Walsh retired in 2014. Let me just say, Platt was so charismatic and incredibly talented, that I didn’t need to worry so much about Walsh’s absence. This show would mark the band’s first return to the Fox Theater since 1989, a fact mentioned early on by bassist Billy Greer, with a shout out to the architectural beauty and character that only the Fox can deliver. Although Greer is not a founding member, he has been around “many years” as he put it. In layman’s terms, that would be 33 years, since 1985. The concert was divided into 3 very specific sets, starting with a 5 song acoustic set, followed by a 10 song “electric” set, and if that’s not enough, the third set was the album Point of Know Return played in it’s entirety, start to finish. It was enough to send me straight home to dust off my vinyl and continue to listen well after the last song. Fresh off the heels of their Leftoverture Tour, the current lineup includes Ehart, Williams, and Platt, as well as Zak Rizui on guitar, David Manion on keyboards, Billy Greer covering bass, and David Ragsdale, playing Kansas’ trademark violin flawlessly. 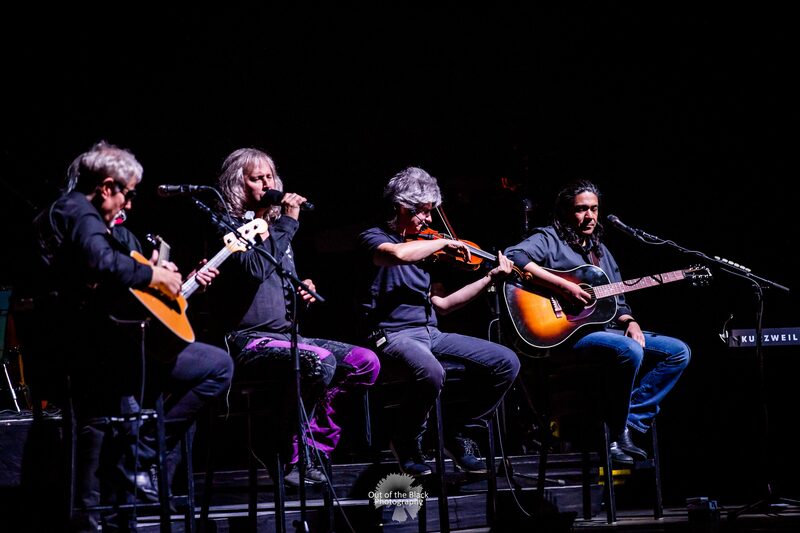 The acoustic set started with 6 of the band members seated center stage, kicking things off with People of the South Wind, and including power ballad Hold On and newer song Refugee. The end of the acoustic set featured Ehart stealthily taking his place at the drums and delivering a powerhouse hit at the end of Lonely Wind, the last of the acoustic set. That drum segue into the electric portion of the show was super dramatic and was the first of my many goosebumps to be had that evening. The second set included an array of songs, from the always hauntingly beautiful The Wall, to the admittedly obscure song Wheels, and a smorgasbord of variety that was sure to fit in the “something for everyone” category. With selections ranging from Two Cents Worth, to Miracles Out of Nowhere, to the instrumental Musicatto, the fans were clearly enjoying every second. By the time they started the main event, The Point Of Know Return, we were all ready for the main event, and the entire audience could feel the electricity. The band was energized, smiling, and let me tell you, Ronnie Platt’s engagement, facial expressions, and stage antics, delivered some of the best parts of the show. Nearing the end of the album, things got a bit theatrical when they brought out stage props including a park bench, a study table with a globe, and a tombstone for the second to last song, the melancholy Nobody’s Home. An interesting side note, the name on the tombstone was “Winchester”, presumably a nod to the TV show Supernatural, the enormously popular show which has featured “Carry On Wayward Son” since the season one finale in 2006. After wrapping up the final set with Hopelessly Human, I did not see a single fan leave, with the promise of the Carry On Wayward Son finale, which was delivered flawlessly and with the most spectacular drum solo to finish it off, making me wonder where on earth 68 year old Ehart gets his energy and strength. More goosebumps.